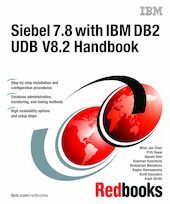 This IBM Redbooks publication delivers details about DB2 UDB V8.2 on Siebel 7.8. It outlines the partnership between Siebel Systems and IBM and the benefits of using DB2 UDB to support the Siebel Enterprise. The most commonly used components of the Siebel Enterprise and the DB2 UDB architecture are described. We provide the planning considerations for running DB2 UDB in Siebel environment. The step-by-step installation and configuration details are followed. We then describe information on methods to populate and maintain data in Siebel tables including data archival techniques and information on ensuring data integrity and data quality. The database administration, monitoring, and tuning tools provided by DB2 UDB and operating systems are discussed and the tool usage provided. The book also provides in-depth discussion on high availability and disaster recovery options and setup procedure for a Siebel/DB2 UDB environment. Finally, the book provides information about the components of Siebel Analytics and where these components fit in the overall scheme with Siebel Enterprise.